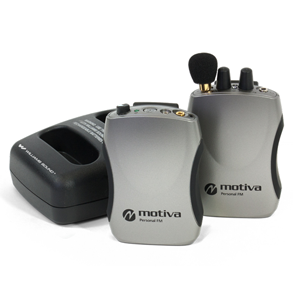 Motiva™ helps you hear where talkers may be too distant or masked by surrounding noise in restaurants, cars, or group settings. Use the transmitter to mix and broadcast a speaker’s voice PLUS an audio program, simultaneously, in one room. Motiva™ can be customized to meet your specific hearing needs with selectable compression and adjustable frequency response. How the system works: The speaker talks into a lapel microphone which is plugged into a body-pack style transmitter. The transmitter broadcasts the speaker’s message wirelessly up to 150 feet (45.7 m). Listeners wear a body-pack style receiver equipped with an earphone or headphone to pickup the speaker’s broadcast. Individual volume controls on the receiver allow the listener to adjust the volume to meet their personal comfort level.Each Motiva™ Personal FM System will operate up to 20 hours at one time.